Strange Frame. Directed by G.B. Hajim. Island Planet One production, 2013. starring Tim Curry, Claudia Black, Tara Strong, George Takei. 96 minutes. 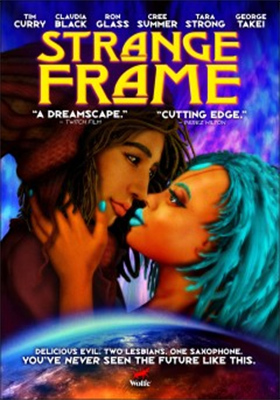 Strange Frame is almost certainly the world's premier animated lesbian sci-fi rock musical. For many, that one sentence will tell them all they need to know to decide if they want to see it. But this complex and visually enthralling tale resists easy categorization. Featuring an array of beloved genre performers and a groundbreaking animation style, Strange Frame presents a story of obsessive love and the seductions of fame set in a gritty posthuman future. In the 28th century, humankind has abandoned the ruined Earth for the moons of Jupiter. For the masses, the price of their migration is to submit to indentured servitude, often for several generations, and many dream of finding the success to buy out their contracts. One such is Naia X (Tara Strong, best known as the voice of Twilight Sparkle in My Little Pony: Friendship is Magic), who as the story opens is pursuing pop-music stardom in the main city on Ganymede. Early in the tale, she meets our narrator, saxophonist Parker Boyd (Pitch Black and Farscape star Claudia Black), who quickly joins her band and becomes her lover. Before long, Naia attracts the attention of Dorlan Mig (Rocky Horror Picture Show star Tim Curry), a talent agent for the system's largest entertainment conglomerate. Mig's praise is effusive and his promises expansive. But after being left behind at a drug-fueled party, Parker is shut out of the band and out of Naia's life by Mig and his people. Strange Frame is the first feature to be directed by GB Hajim, who has worked in the past mainly as a cinematographer. He wrote it with California-based musician Shelley Doty, who also wrote and performed most of the songs in the film (and has a small role as one of three "muses" encountered by Parker). The driving, jazz-influenced rock score permeates the film and provides good illustration for the story while being mostly enjoyable in its own right. But probably the strongest point of the film is its visual style. Hand-painted and digitally-altered characters combine with gorgeous CGI cityscapes to create a unique and beautiful look, heavily influenced by French fantasy artists such as Olivier Ledroit and Jean "Moebius" Giraud. The film is also peppered with bizarre, psychedelic interludes—including, interestingly, clips from several unidentified black-and-white films—that do little to advance the plot but act as luscious eye candy. Of course, beautiful visuals are often not enough to make a compelling feature. The characters, story and performances are also crucial. And here is where Strange Frame falls somewhat short. While the world it creates is fascinating, with much illustration of class and other issues, the main characters are neither interesting nor well-written enough to hold attention on these issues. Naia, in particular, has almost no depth, despite her supposed role as the voice of the oppressed, and both her lines and Parker's are delivered in cartoonish, fake-sultry voices that make every line sound like a double-entendre. The supporting characters fare better. Ron Glass, in particular, provides Grenman with a world-weariness that works very well, despite occasional cheesy dialogue. Tim Curry plays Mig as a classic scenery-chewing villain and seemingly has a great time. And the film also features Star Trek veterans Michael Dorn and George Takei in small roles that provide some depth. Finally, and unfortunately, the plot is somewhat disorganized, to the point that it is sometimes difficult to follow the action. A subplot involving a rebellion by the AI on Grenman's ship seems particularly unnecessary, and it is dropped near the end without any clear resolution. There is also a flashback involving a slave massacre that could have been an interesting tale on its own, but here has little connection to the main plot. Fortunately, neither detracts in any major way from Parker's story, and they do provide some illustration of the class issues working in the background. In sum, Strange Frame is a flawed but fascinating visual journey. The rich SF setting and immersive, psychedelic graphics provide a background for characters that are less than compelling and a story that sometimes fails to maintain interest. Fortunately the aesthetic beauty of the film is enough to mostly overcome these problems. Strange Frame is a landmark for its visuals alone, and even if the rest of the film fails to live up, it will still be a rewarding experience for many viewers.